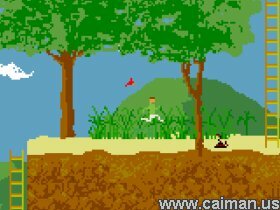 Caiman free games: Cliffall - Treasures of the Lost Cave by Aloan (ursinho). A platformer with a retro-look. There is a big surprise, and another super big one on this update! I'm not gonna spoil! Also, I bet no one has discovered yet what a hidden secret lies on the tree after the angry crow! The new level will probably be started today... I can't wait to make the game even bigger. Oh, and yes, of course, there will be those crocodiles pits, rivers with piranas, waterfalls, there's a lot coming. So far I have barely touched what the game has to offer! Reasonably good game, Though the graphics are quite simple. I really adored the feel of the game. Retro Fun !! I found it hard at first to determine which fish would kill me at first. 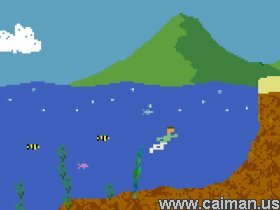 I didn't really think that prerendered looking fish quite suited the feel of the game either. Obviously some of the movement doesn't quite feel natural due to the coding of it. I agree with most of the comments above. Screen scrolling and movement engine could use some tweaking. It would be best if the game could have a custom movement engine. The default engine is just always so jerky. But it works well enough as it is, it could just be better. I encountered a glitch that forced me to stop playing. At one point I went down a ladder to the screen below but the camera didn't go down there with me. The camera kept viewing the topside as I tried blindly to find a way back up. It would scroll horizontally when I would leave the screen, but whatever triggers the vertical scroll missed it's mark somehow. But overall I think its quite good!